Craft storage that shows that I practice what I preach! Hello, it’s Hazel all the way from sunny South Africa with you today to share the latest addition to my craft storage – My Locker Love!!! Remember that you hopped around the interwebs with me to see what other Bloglanders did with their lockers??? OK, if you forgot what I shared or missed that post, just revisit my Craft Storage Ideas Locker Love post and you can see what I shared. Between you and me, this post was my fave!! My husband and I ended up with a house too big for us after both our boys left. As we live in Stellenbosch (a university town) and flat rentals are a very good source of extra income, we converted 2 “unused” rooms into a self-contained flat. Perfect, BUT…I ended up losing 2 BIG cupboards that had been invaded by my fabric stash over the years. My Craft Closet is filled to the brim, so I had to think out of the box (No, out of the CLOSET!). After I did the Locker Love post, I came up with the brilliant idea of adding a row of lockers to an unused space between our garages and the house. I would have loved to use some recycled lockers, but as I wanted a rather uniform look, I opted to buy new ones. To my fellow South Africans, I found these lockers at Just Steele, bought them online and four weeks later they were delivered to my door!!! This one is “slimmer” than the rest of the range and I wanted LOTS and LOTS and LOTS of cubbies. I chose the two-tone cream and beige color as I thought the grey would look too industrial. In hindsight, I should have chosen the grey. My taste is rather industrial. BUT, in the long run, I plan to have them spray painted fire engine red or with a black chalkboard finish. In the meantime, I’ve transferred my fabric stash from our extra bathroom to the cubbies. Here is a “before” pic. Who can spot the bath??? I sorted the fabric in groups of dress fabric for summer, plain and printed; dress fabric for winter, plain and printed; curtain; upholstery; sheeting; and, haberdashery. I’m still working on a system of labeling the cubbies and making it SUPER easy to find something at a click of a button / turn of a page, so you’ll have to come back next month to see what I’ve done. please leave me a comment or share a link. before I make up my mind. I’m off to get the truck load of patterns sorted that arrived from my mother (and grandmother before her), but that’s a story for another day. Thanks for looking at My Locker Love. I’ll be back next week with GREAT ideas for traveling with crafts to keep your little ones busy. Please check back and all will be revealed. And when you have a moment, please swing by my blog – PlayAsUGo – and say hello! 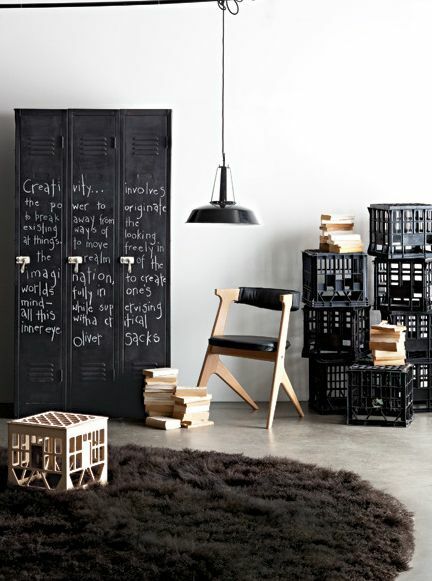 Love craft storage ideas and craft space shares like these? Don't want to miss a single thing? Photos & Digital SuppliesHard to Manage? CHECK OUTGather & ScrapRoomSuper Simple Solutions! Looking forCraft Supplies, Paper Planners, Pens & Markers, Washi Tape& Fun Dollar Spot Goodies?Target's Got It All! WANTED!PROFESSIONAL CONTRIBUTORSInterested in sharingYOUR organizingknowledge & experience? ClICK HERE TO APPLY Tell us why you feel you'd be a great fit for our team! WE HELP YOU SAVE! *****COUPONS BELOW! *****Click on any coupon below to SAVE BIG on everythingyou need for crafting! Craft Storage Ideas: Sale Alert! Craft Storage Ideas: Sale & Giveaway Reminder – LAST DAY! Craft Storage Ideas – Tools – An Idea, A Sale & A Giveaway! Craftroom Storage: Ink Pads – Hang Them Up! Sherry S on Upcycled Storage Ideas – Reusing What You Have! Stephanie Hackney on Craft Storage Ideas: Sale Alert! barb macaskill on Craft Storage Ideas: Sale Alert!